A lazy Sunday morning. The sun had begun its slow ascent above the horizon hinting at the possibility of a perfect day. Outside the window a mixed chorus began, the music of cardinals, robins and finches, the cacophony of crows and gulls. Though their songs and calls had awakened me and had reached such a level as to make a return to sleep almost impossible, I also found them conversely soothing. Which is strange, given that this was the weekend and as a working girl I'm rather selfish about the two opportunities it provides for a bit of extra sleep. To disturb me then is to take your life into your hands. Yet, though the sky still held a shadow of darkness, though the clock hadn't struck six, I felt content. Though the discordant cries of the larger birds were something I could have done without they were balanced by the pretty tones of the songbirds. It was the best alarm clock. Perhaps it's my age; I don't recall being so enamoured with our feathered friends when I was younger. But, in recent years I have found myself becoming increasingly fascinated in their actions and activities. Robins and their welcome return to the area heralding that spring is here, offer some of the best entertainment. 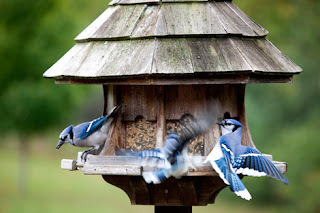 From the playful pleasure they demonstrate in a rain to the skips and hops around the yard in search of worms, they are ever present and habitually on the move. 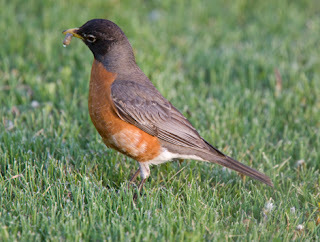 With two nests in our garden this spring, there have been an abundance of fluffy baby robins to amuse us. We discover them in various places close to us— on the deck, on a chair — sitting for hours before puffing out their chests a few times then testing their wings. Their short flights to the closest branch always make me smile after a performance of such bravado. Our red-chested friends aren't the only ones to intrigue me, however. The elusive cardinal teases as it moves from treetop to treetop. My eyes turn toward its distinctive song in the hope of catching a glimpse. When they do come near us, at feeders or in flight, they never linger long. I am, therefore, inspired to stop everything I'm doing to watch. The pretty, though noisy, blue jay is an aesthetic treat and a mischievous scamp. In the bird world, he's the dude with colour as vibrant as his squawk is strident. That he's also the symbol for our Canadian Major League Baseball team makes him a fan favourite too. Then there's that little mimic, the oriole. Many slow minutes can pass as you listen to him repeat the whistling sounds you sent its way. Its brilliant colour enlivens the space it enters. Lively golden finches, tiny sparrows and cute chickadees flitting and flying around the yard might not get quite the attention of their more flamboyant peers, but they're always welcome.